Fall has not yet arrived here temperature-wise even though the calendar says it has. I decided to go ahead and welcome it with open arms anyway in hopes that my enthusiasm will make a difference. I love cooler weather. I love seeing the leaves change colors and dance their way from tree top to pine-laden black top. I love that slight nip in the air. Not so cold that you have to bundle up, but just enough to make you settle into your jackets and sweaters with cozy comfort. I love a fire place and an outside marshmallow roast. Football games and brisk morning walks. Speaking of walks, I decided against using the Elliptical machine this weekend even though it pretty much guarantees a 600+ calorie loss. Instead I opted to walk to the river. My reward, I convinced myself, was the opportunity to photograph the water and sky without having to park in someone's driveway or risk a car coming up behind mine as I scoot to the edge of the bridge. That reward at least took care of the first half of the trip. Trudging home I decided that getting to look through my photos would be my reward for making it back. I had purposefully left my glasses at home. Did I tell you that my neighborhood is full of very steep and very long hills? Which is why I took this photo. It may not look all that steep here, but it is. Believe me. And the bad thing is that when you're standing at the bottom of the hill looking up, all you have to do is turn around to see another hill just as steep and even longer on the other side. I can't tell you how many times I've considered sitting down and waiting for someone to come by and give me a lift. I've imagined myself going back and forth between the two hills and never reaching the top of either one. And the best plan I've come up with involves a helicopter hovering overhead and sending down a ladder for me to climb up. But when all is said and done, my mama always told me not to accept rides from strangers, so waiting for a ride is out of the question. Going up and down each side hoping I'll gain momentum like on a carnival ride won't work. There's no generator or electricity to keep me going. And the helicopter.... That's.Not.Happening. What it takes to climb that hill is to put one foot in front of the other. And then do it again and again until I reach the top. As I made my way up, step after step, it occurred to me that reaching the top of that hill is a metaphor for everything that happens to us in life. There's usually not going to be an easy way out. That's for sure. 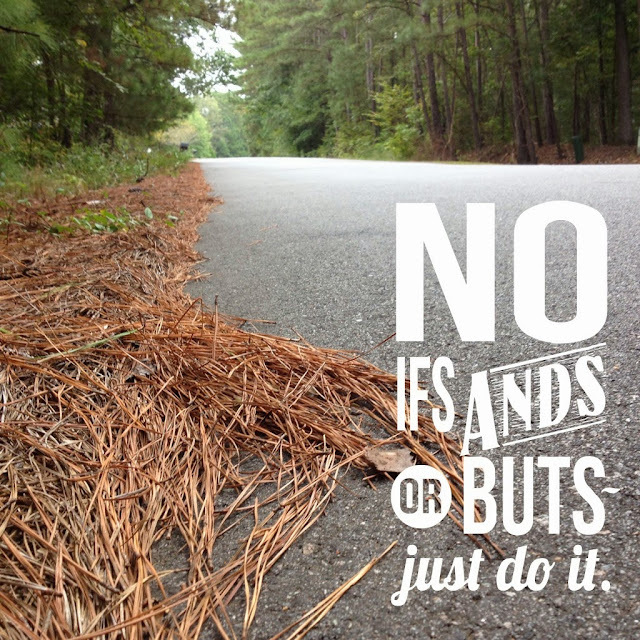 What it takes, without any ifs, ands, or buts, is to just do it. So I did. I hope you reach the top of whatever hill you're trying to climb. And that you're hills aren't falling too close together. Ah such an inspiring story Roban! This is what life is all about and thank you for reminding me that all it takes to climb a hill is to put one foot in front of the other. Love the way your mind works "helicopter hovering overhead and sending down a ladder for me to climb up"....that made me smile. I try to remember, in the end, we only regret the chances we didn’t take and the decisions we waited too long to make. Hope you have a wonderful relaxing birthday today (no hill climbing) and I am sending you big hugs and heaps of love too. Keep shining my delightful, witty friend. Ohhhhh this is such an amazing post. The easy way out generally has hiccups and consequences-2 things I want to avoid.....like the plague!! Great shot and edit Roban. You're awesome!!! Ah yes! That "it doesn't look that bad" steep hill. I've got a few of those to tackle during my daily walk .... sometimes I just want to sit down and say "I can't do this"....sometimes I just want to turn around and walk downhill .... but I always go ahead and tackle it and although my lungs are screaming and my legs are aching .... I do it and DANG!!! it feels good!!! do you have the app "map my run"....we love it even though we only walk. and the jawbone "up" to count your steps and how you sleep etc. is our newest thing here....it's a bracelet and the hubs is in love. mine gets shipped later this week.